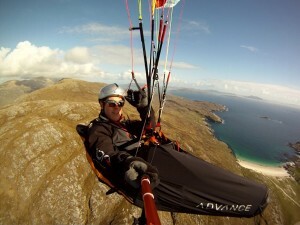 Above the Outer Hebrides at 5000′ feet ! The most northerly island is called Lewis and this is mainly flat with amazing white sandy beaches with crystal clear turquoise seas. Many of the beaches are backed by sandy dunes, some that stand as high as 20 metres. 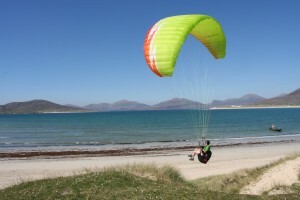 Armed with an IBEX 2, it didn’t matter that the wind was strong as it was ideal for this kind of dune soaring. The second day, I moved nearer to the mountains that are on the North Harris island (well-known for its tweed material), these mountains are a respectable height, with the highest An Cliseam topping out at 799m. It was forecast quite strong aloft from the North, but it was worth a try on the foothills. Having walked in a few kms to get to a suitable launch site, it didn’t seem as windy as forecast. The thermals were small but strong, so needed a fair amount of concentration to gain height. Having patiently climbed to the summit of An Cliseam, it was clear that the wind up here was as strong as forecast with my GPS reading 5km backwards. Taking a climb from the summit took me to a height where I could clear the fearsome lee and fly off to the south. 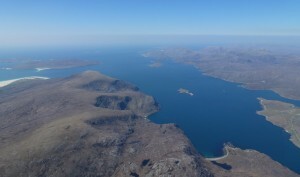 After a few more climbs on slightly lower ridges, I was resigned to landing in the town of Tarbert which separated the North and South Island of Harris. At about the height that I was starting to look for a landing place, a football field looked favourite, but then I got into a weak climb. The climb eventually got stronger and as I got higher, much rougher – nothing to bother the trusty ION2 Light that was above my head. Going higher and higher, the 360 degree view of the islands from about 5000′ was simply stunning. Having enjoyed more dune flying on the IBEX 2 most days, I moved to the west to a very isolated couple of beaches that had a 489m hill overlooking them. This beach called Husinis turned out to be the most perfect place to be. The hill allowed some very late night flights down to land on the beach, as well as super smooth coastal air soaring in the day. One flight proved how flying paragliders gives us a perspective on the world that is incredibly privileged; I had walked up the hill above the beach, taken off on a perfect grassy take-off, into air that was so smooth and steady that my GPS kept stopping the recording because it was thinking I had landed. The view into the water below was amazing and it didn’t take too long to spot a number of large fish including a Ray, a group of basking sharks which were thrashing near the beach, but it was seeing 6 whales that blew me away. I wasn’t sure what they were at first, as I could only see their wakes, but flying closer and closer I could see them arch their shiny grey bodies out of the water with an occasional blast of spray from their blowholes. As an amazing location I can fully recommend this place, with a paraglider to hand it becomes priceless. If anyone would like more information on exactly where I flew, contact me on steve@nova-wings.com. thanks for the story, we thought about a scottlandtrip next year anyway :-)…. great experience, great reading – I am JELOUUUUUS! You should offer it to the mags!